Today is the winter solstice. The day of the year with the least amount of daylight hours. With an impressive north to south distance this day in Sweden means a range of no daylight in the northernmost reaches of the country to 7 hours of daylight at the southernmost point. Perhaps surprisingly, I find this day to be uplifting. It means that the daylight is on its way back. Alternately, I find Midsommar depressing because it means the darkness is coming. So with Christmas around the corner and more daylight slowly returning I’m a pretty happy camper. But not everyone is quite so jolly. Many people say that despite the southern portion of the country having more daylight it is actually more depressing here because snow is unusual. A flat gray sky blending into the bleak winter landscape can indeed weigh heavy on one’s spirits whereas areas that receive snow are perceptively lighter and brighter. So what do people in Sweden do to bring light to the darkness? 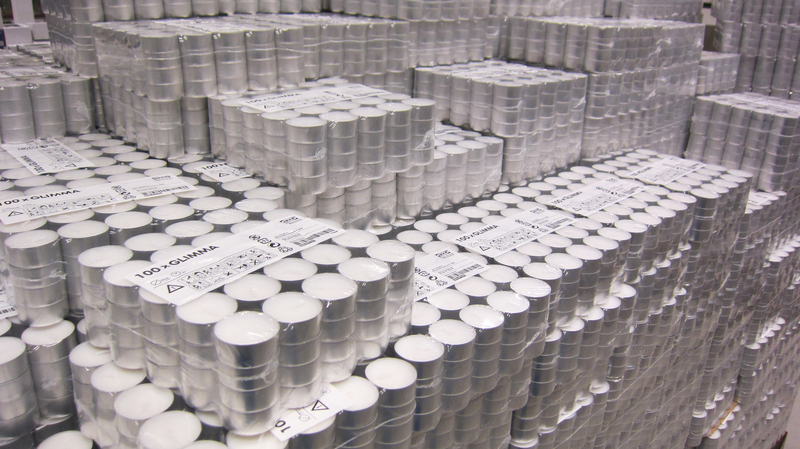 Candles, candles, candles. 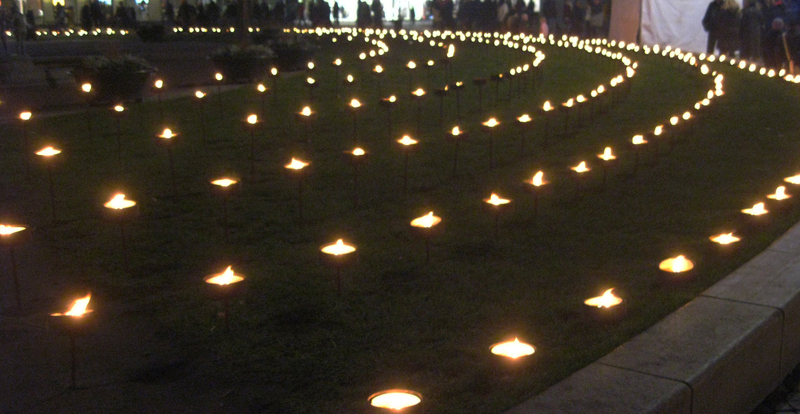 I have never seen so many candles. Tea lights are a regular item on everyone’s shopping list. As soon as it begins to get dark early businesses place lanterns outside their doors and some even light candelabra in their windows. Fire pots pop up on doorsteps and in public spaces. 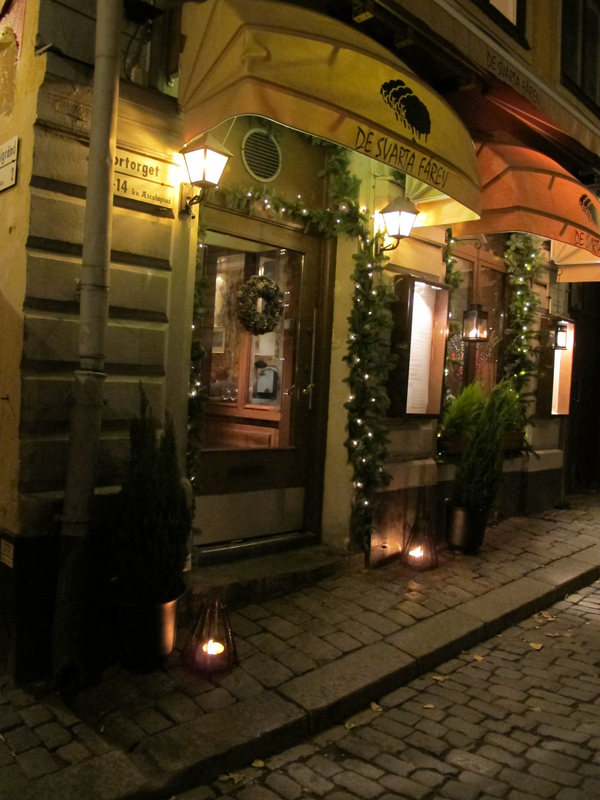 On a recent trip to Stockholm I loved the fire stands you could cozy up to and warm your hands. Open flames in public is definitely not something I grew up with in the U.S. I think people are too afraid of accidents and litigation but I have yet to hear of anyone in Sweden going up in flames because of it. Something I find interesting here is lamps in the windows. Not only is it common to have a lamp in your window, but often there is a pair of matching lamps. What a boon for lamp manufacturers! 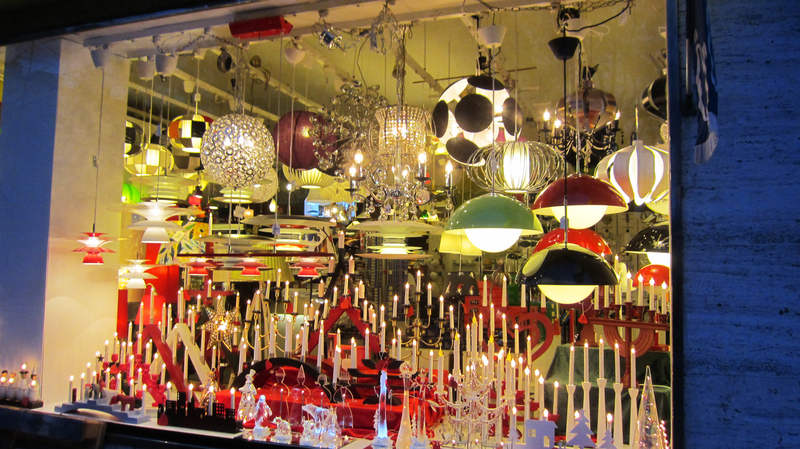 Maybe I’m just not remembering it right, but I don’t think lamps in the window are particularly common in the U.S. Unless of course you are thinking of the glorious leg lamp in A Christmas Story, but there was only one leg, not a matching pair (and if you don’t know what I’m talking about, get thee to a video store and rent that movie for the holiday…it’s hilarious). 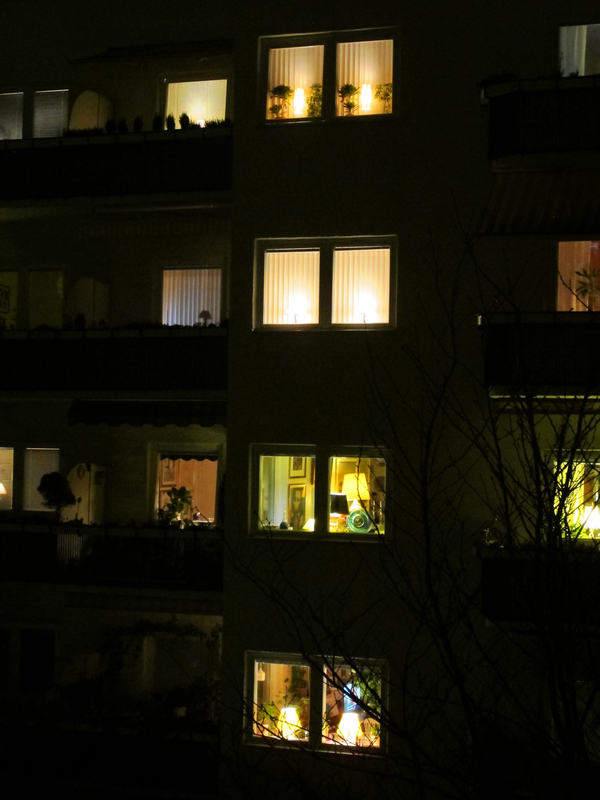 My theory is that people place lights in the windows to evoke a sense of more daylight. As for two lamps, I have no theory on that other than…well, simulating even more daylight? It’s a little difficult to see, but in the photo on the left, three out of the four stories have matching lights in the windows. And the photo on the right is like a double, double whammy…two pairs of matching lights. That may well be a record. It’s a bit tough to get these shots, not only for the technical challenge of taking them in the dark, but also for the freak-out factor. I would be concerned if I noticed a strange person standing out on the dark street taking pictures of my house. Which brings up an interesting difference here. People don’t seem to be particularly interested in curtains or blinds aside from the decorative aspect. They are used in bedrooms for privacy and to block out light for sleeping, but in most living spaces the blinds/curtains are left open all the time. That differs greatly from where I grew up. Each evening my mother would come in and draw the translucent curtain in the living room when it got dark and the opaque one before going to bed. Of course the holiday season is the perfect time to brighten things up with Christmas lights. The First Sunday of Advent is the moment that the Christmas decorations come out in force. 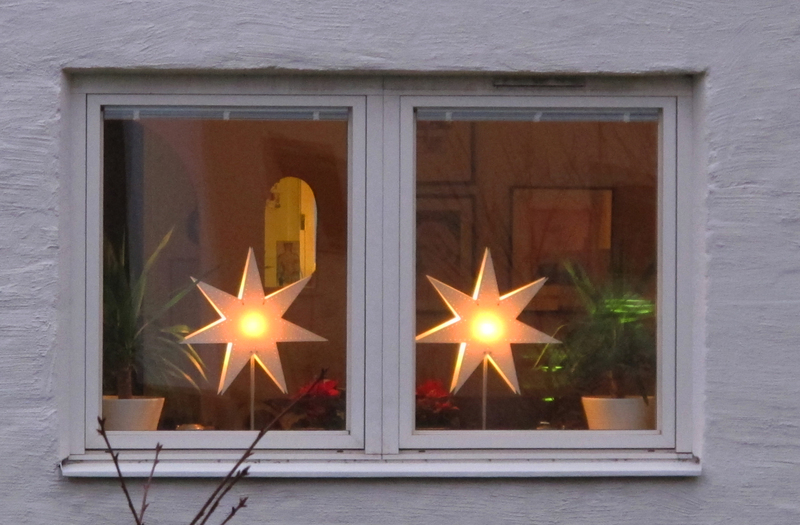 Advent stars (adventsstjärnor) symbolize the star of Bethlehem that guided the wise men to the baby Jesus in the manger. They bedeck business and residential windows alike with various sizes, colors, and numbers of points. 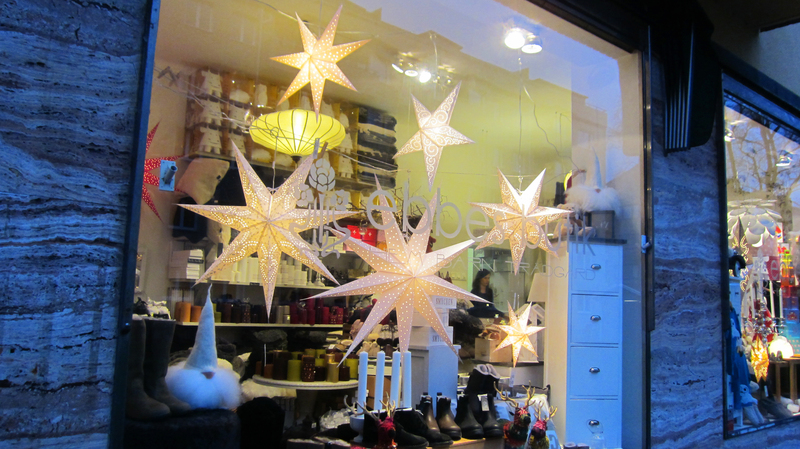 The paper stars originated in Germany in the 1880s and started to be imported to Sweden in the 1930s. It wasn’t until 1941 that they were manufactured in Sweden. Erling Persson who would later become the founder of Hennes & Mauritz (H&M) wanted to create a cheaper version of the stars in comparison to the expensive German imports. His red cardboard stars covered with little star-shaped holes were an instant success. The tradition spread quickly and has held fast. Today you can buy Advent stars in wood, metal and straw versions as well. And of course you can always choose to get matching stars. The other common light this time of year is the electric Advent candle sticks or adventsljusstakens with seven lights representing the days of the week. They were first manufactured in 1937 by the Philips company in Gothenburg and quickly gained popularity as a safer alternative to open flames. They are linked to an old Swedish tradition of placing lighted candles in the windows to help light the way to the church for Christmas worshipers. Today you can buy them in various colors, materials, shapes, and sizes. 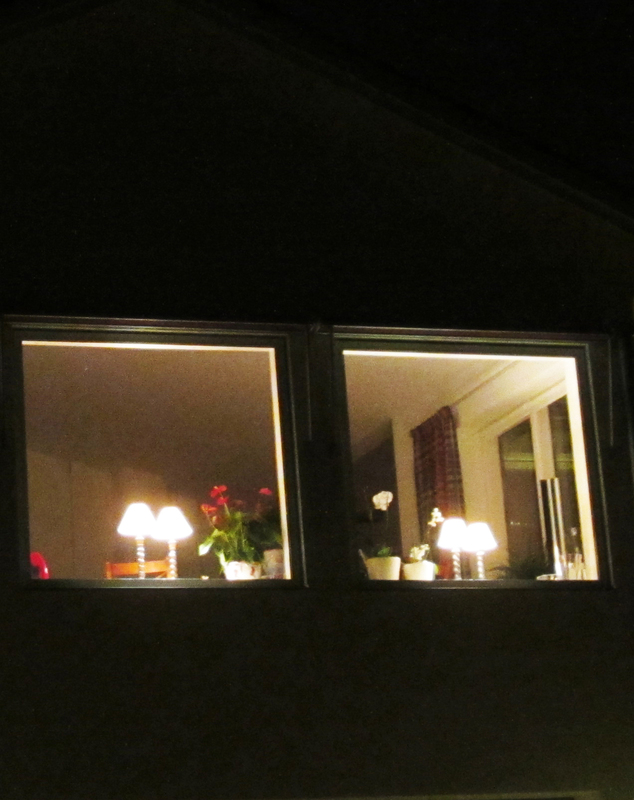 Being part Swedish, we had adventsljusstakens in our windows at Christmas time when I was growing up. On more than one occasion they prompted my teenage friends to ask if I was Jewish. That still makes me chuckle. In addition to all of these light sources there are also Christmas lights up in every city and town. But to my dismay the overwhelming majority of the lights are white which perhaps creates the brightest light source, but makes me really miss colored lights. Colored lights are so unusual here that they really make you turn your head. My 4-year-old nearly jumped for joy when she saw a measly little strand of colored lights dangling merrily on a neighborhood balcony. When I was little it was always fun to be riding in the car and looking down the different streets to see the various colorful displays. White lights are much more common in the U.S. now too, but the colored lights are still out in force and I really do miss them. The natural phenomenon which brings light, and color to the northernmost portion of the country is, of course, the Northern Lights. As much as I would like to see them, I am very thankful that I live in the southern part of Sweden at this time of year. At some point I’ll have to make a Northern Lights-focused trip and perhaps check out the ice hotel. For some, a serious result of all this darkness is Seasonal Affective Disorder, or SAD. A very real problem in Sweden affecting around 25% of the inhabitants. The darker days can lead to changes in mood, appetite, and sleep patterns. Some people have SAD to the degree that they benefit from light therapy. Special SAD lamps emit light that is nearly four times brighter than the brightest standard indoor fixtures. Utilizing the lamps anywhere from 30 minutes to several hours a day can be of great benefit to some SAD sufferers. Thankfully I don’t think I yet have the need to invest in such a lamp. Here’s hoping I never do. The Christmas lights will help to fray the darkness for most of the country through January, and often well into February, and candles will play a helpful role until the longer daylight hours return. But there IS one last thing you can do to counter the darkness. 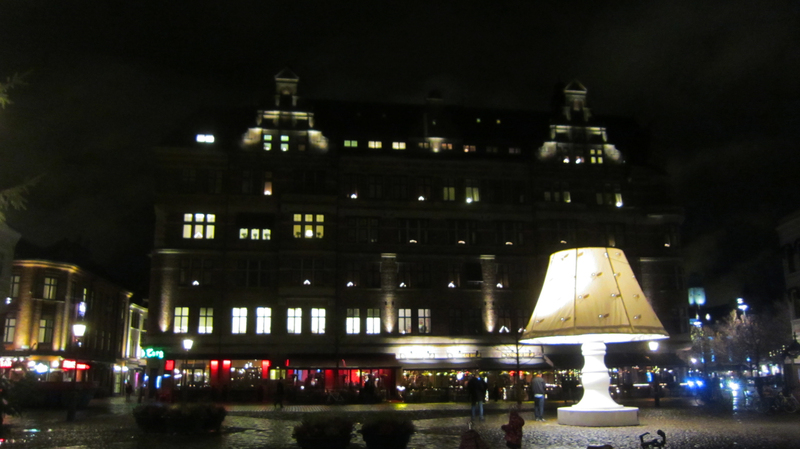 You can always plop a giant lamp down in the square as they do in Lilla Torg in Malmö. If they’d just get a matching one they’d be all set. 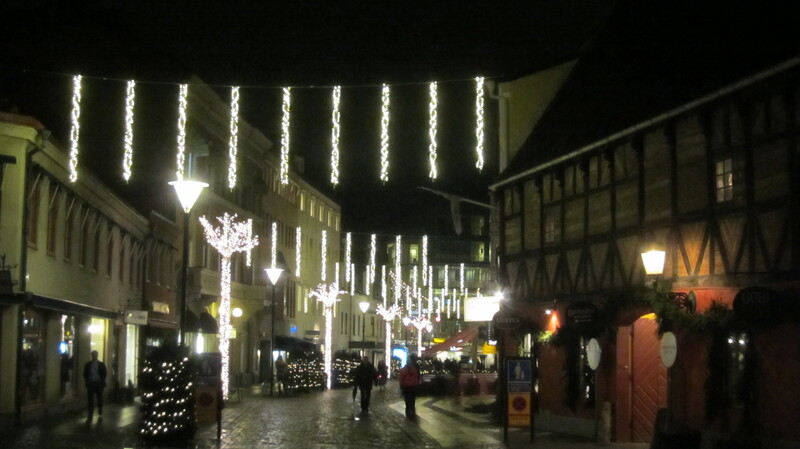 That’s a wonderful post especially remembering our time with you in Malmo last Christmas. What a dramatic difference in snow from then to this year! Malmo is about 55 degrees north latitude while Moscow, Idaho, is about 47. We could see.Northern Lights in Moscow a few times and once, even in Ames, Iowa 42 degrees North. Maybe there are too many urban lights in the Malmo area.. Your final images of the square were so beautiful. I was very impressed with the large building and lights in it. The fires and rings of fire pots. I truly enjoy the flexibility of your topics.. You’ve put a lot of effective planning into it. I remember seeing the Northern Lights in Logan once. I can still see them in my mind’s eye over the Stanley’s house. I really do want to get up north to see them sometime. Maybe in the next couple of years when the girls are a little older and mom and dad can slip away for a weekend. I remember seeing the Northern lights from our front yard too as a kid. I can only imagine how difficult it would be to live in a country that is so dark during winter. Here I despise the fact that when Ross gets home from work its dark outside, but it is light during the day and so bright sometimes you must wear sunglasses. The city pictures you have posted are really beautiful! I’m glad that you remember that too and it wasn’t just a weird dream or something. As far as darkness goes, interestingly it’s only 2 hours less of daylight than in Logan. But no need for sunglasses here. Glad you liked the photos. Merry Christmas! As for the colored lights issue, I know that a lot of people have the opinion they are tacky. Personally,I find that a downer because I find the profusion of white lights kind of dull. When you are driving around it’s just as though there are extra lights on the homes or in the windows, not that something festive is going on because it’s all so similar. I like the expression of the variety…colored and white. And although I’m not a fan of the blinking lights either, I still get a kick out of seeing them on the occasional house in the U.S. I really enjoyed this! Great pictures and commentary. Sweden is a special place. I’m sure that the lamps in the windows are to replace the natural light source with light coming from the same general direction – to trick the body into feeling ‘OK’ because light is coming from the windows as it ought to do! We are in a village with fields behind us, only one street light visible in front and only a few other house windows visible from ours, so I suspect that the effect of our own window lights is magnified. It is also much more pleasant to walk the dog around the village when the gloom is broken up by the lights in the house windows! At first I considered the ‘candle arches/bridges’ to be Christmas lights but I have since renamed them as winter lights, their primary function being to counteract the dark months of the year rather than to celebrate Christmas itself. This gives me the excuse to have white winter lights everywhere, but to have coloured lights on my Christmas tree should I wish to! Hi, I’m a graduate student in landscape architecture writing a thesis on light and warmth in public spaces in Seattle at nighttime, and this post has given me some helpful ideas. Do you mind if I use your picture of fire pots in my document? Could you tell me where in Stockholm it was taken? Thanks so much! 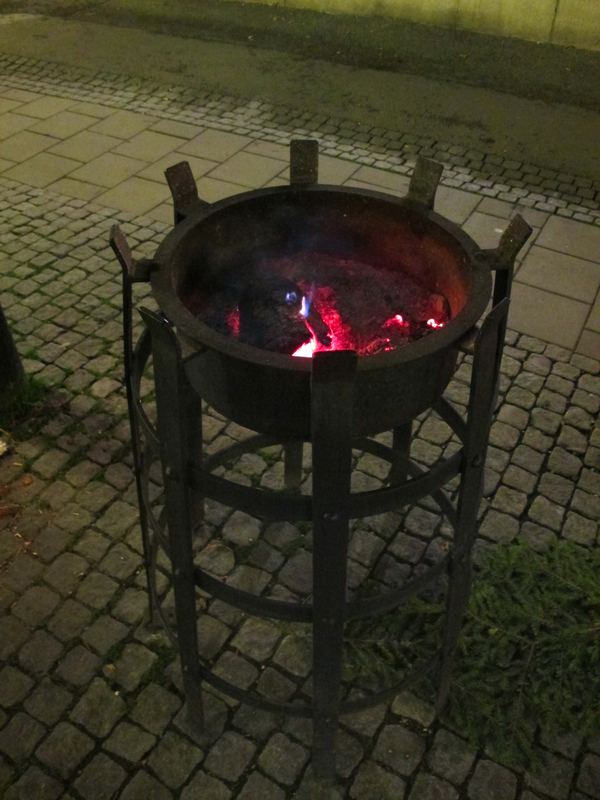 The third photo with masses of fire pots is actually in Malmö at Gustav Adolf Torg. The single stand, that I guess could be considered photo 5, was in downtown Stockholm, but I don’t remember where exactly. I can figure it out if that is the photo you want to use, which, by the way, you are most welcome to do. Best wishes with your thesis.